CONCOURSE VILLAGE — Devin Harris, 17, and a few friends were ambling along E. 161st St. Thursday night when they noticed dozens of eyes pointed their direction. 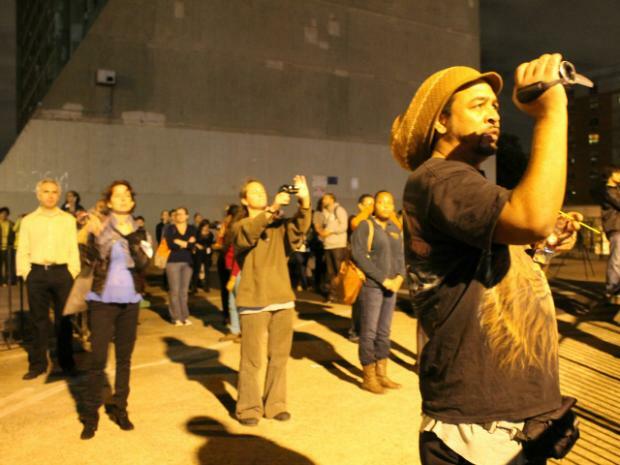 Quickly they realized the crowd wasn’t staring at them, but at the side of a 29-story public housing tower behind them, where a projector beamed bright blue statistics about police use of the stop-and-frisk tactic in the neighborhood. The outdoor projection Thursday marked the first public display of data collected through a survey of 1,000 Concourse-area residents by a team of researchers from the Public Science Project that included academics and local residents. The survey found that, with nearly 4,000 stops last year in the 40-square-block neighborhood around Morris Avenue, most respondents had been stopped by police, often for causes they considered bogus and under conditions they felt were degrading. A few dozen people gathered outside the Morrisania Air Rights houses at Park Avenue and 161st Street Thursday evening for the projection event, which was still underway when police arrived in three vans and a cruiser and ordered the organizers to stop, citing their lack of a permit. The statistics and a short video were beamed onto the building by a projector mounted on a van called The Illuminator, which was rigged during the Occupy Wall Street protests. During the display, a group of residents who were part of the research team read a letter that was addressed to the police and broadcast over loud speakers. The letter began, “Dear NYPD, we are the Morris Justice Project,” the name for the survey team, which also included researchers from Pace University Law Center. The projection and voice-over cited NYPD data that shows 3,920 people were stopped last year in the neighborhood, which falls within the 44th Precinct. They also referred to the survey, which found that 67 percent of respondents were stopped by police last year. Half of those stops involved some use of physical force, according to the researchers. Last summer, the university researchers invited residents from around Morris Avenue to a local library to help plan the anonymous survey. Locals said the neighborhood’s boundaries extended from Sheridan Avenue to Park Avenue and from 167th to 161st street, so that was set as the scope of study. Freewheeling discussions the library group had about police led to the survey questions. The survey’s seven pages center on experiences with and attitudes towards cops, as well as feelings about the neighborhood and personal demographic information. Jackie, a resident who declined to share her last name because she said she is involved in a lawsuit against the NYPD, said she joined the research team in the hope that revealing the impact on the community of tactics like stop and frisk might inspire the police to reform them. Officers citywide conducted a record number of street searches last year — more than 684,000, according to police data. Ninety percent of people stopped were released without being arrested or issued a summons, and 87 percent of those stopped were black or Latino, the data showed. The NYPD says the stops help rid weapons from the street and have contributed to the steep decline in violent crime over the past decade. The Morris Avenue research team pointed out that while police stopped about 11 people per day in the neighborhood last year, they recovered just eight guns in the area, according to the team’s analysis of police data. Clinton Whitfield, 24, who lives in an apartment at Park Avenue and 161st Street, stopped to watch the projection Thursday. He said he was stopped by police recently while walking to church. He said the officers told him his red shirt indicated he was a gang member, which he denied, insisting that he spent his day working. “They were a little nasty. They didn’t believe what I said until I showed them proof,” in the form of a UPS employee badge, said Whitfield. Damica Brown, 33, who lives in the same building, said that after one too many bad encounters with the police, she had learned not to rely on them. “You might as well just deal with problem yourself as best you can,” she said. After the police arrived Thursday to stop the projection, a woman called down from an apartment overlooking the scene. “I bet if there was a crime the police wouldn’t show up like that,” she said.